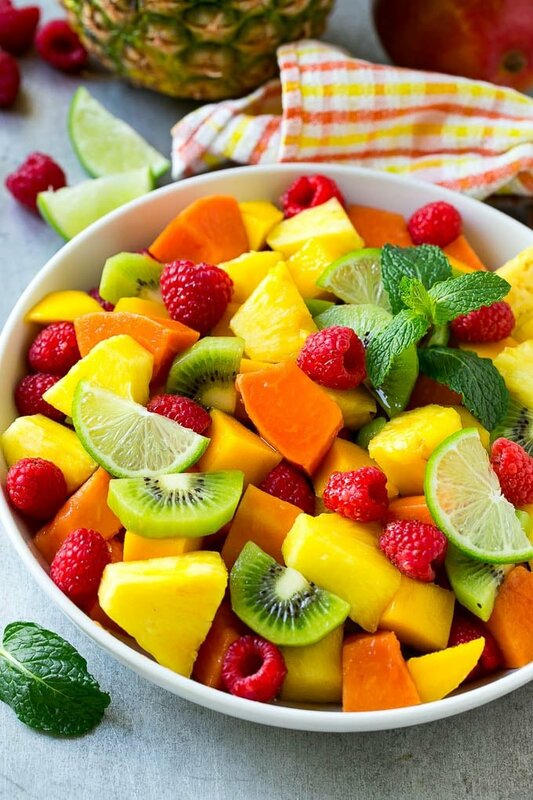 This recipe for tropical fruit salad is a colorful mixture of mango, kiwi, papaya, pineapple and raspberries coated in a honey lime dressing. The perfect summer salad! 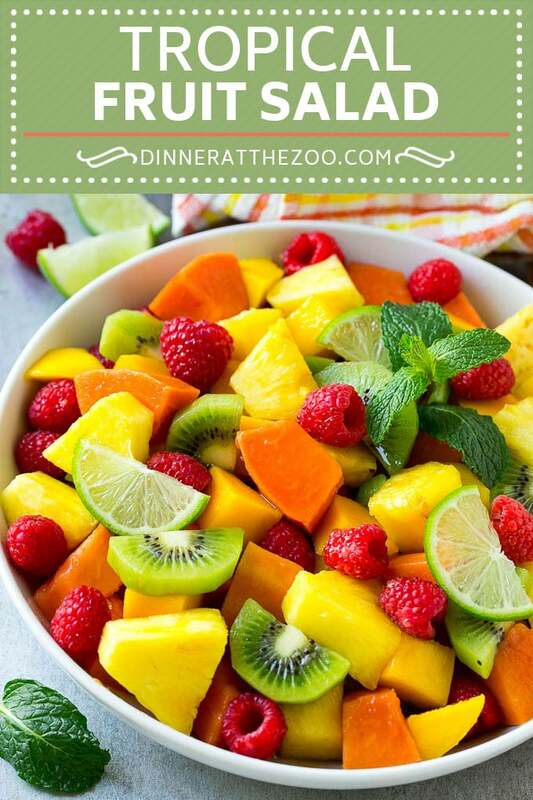 This refreshing and colorful combination of tropical fruit is an easy side dish that’s great for entertaining or for an everyday meal. When I think warm weather, I think tropical – I just can’t help it! It’s been a long time since taken a Hawaiian vacation but I’m still constantly creating dishes with island flare. 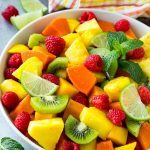 This tropical fruit salad is the perfect summer entertaining recipe – it’s great for brunch, the perfect make-ahead potluck fare, or the ultimate refreshing side dish for a barbecue. And while fresh fruit is great on its own, it’s even more amazing when you pair it with an easy honey lime dressing! 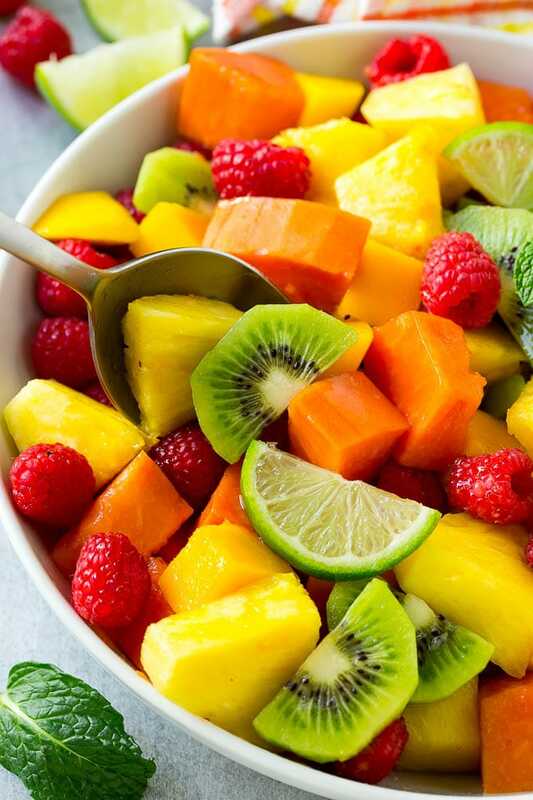 How do you make tropical fruit salad? For this recipe you’ll need a variety of fresh and colorful fruit like pineapple, papaya, kiwi and mango. I added raspberries here even though they’re not technically a tropical fruit, simply because they add great color and flavor. The fruit gets get into evenly sized pieces, then gently tossed in a simple combination of honey and lime juice. What fruits are good to mix together? When I’m making a fruit salad such as this tropical fruit salad, I try to go for a variety of colors, flavors and textures. I also use hardier fruit that won’t brown or turn mushy in the salad, I avoid apples and bananas for the most part for that reason. There are typically two different types of papaya available at the grocery store – the large, elongated Mexican papayas, and the smaller, pear shaped Hawaiian papayas. I typically use Mexican papaya for this salad because it’s a beautiful orange color and costs a lot less than the Hawaiian papayas. This tropical fruit salad can be made up to one hour before you plan to serve it. I don’t recommend trying to store it for longer than that, simply because the delicate raspberries and papaya may break down in the citrus based dressing. 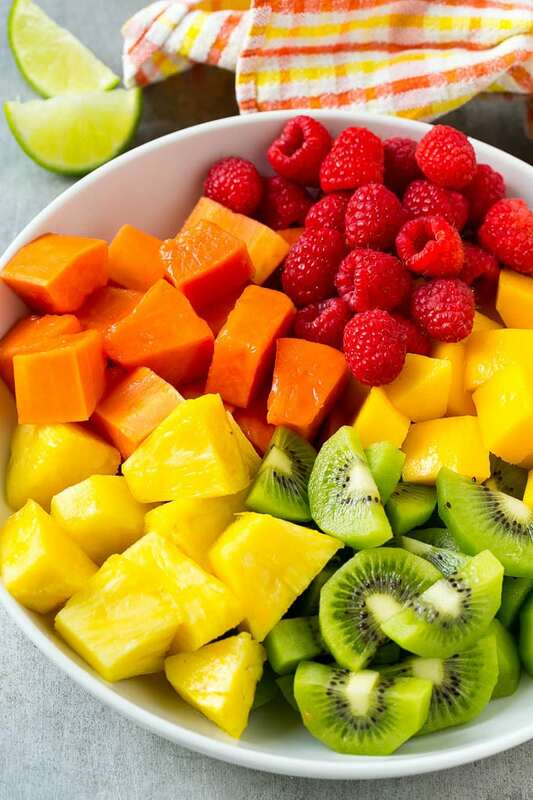 Place the pineapple, papaya, mango, kiwi and raspberries in a large bowl. In a small bowl, whisk together the honey and lime juice until smooth. Drizzle the dressing over the fruit and toss gently to coat. Serve, garnished with mint sprigs and lime slices if desired. This post has been sponsored by Blue Diamond Almonds. Thank you for supporting the brands that make Dinner at the Zoo possible! This post was originally published on May 10, 2016 and was updated on May 9, 2018 with new content and photos. I love fruit salad, especially for breakfast or as a light dessert. I love the variety of fruit in this salad. A fruit salad screaming summer picnics and bbqs. i will be making a bunch over the summer! Your salad looks like a real great treat. Love the colors, the different texture, and the various taste in one bowl.